Il existe de très nombreuses variantes de ce drink. Voici ma préférée. 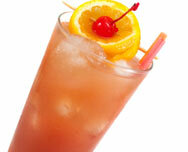 This drink is a refreshing tropical fruit drink. I recommend this drink to the people who like refreshing tropical drinks. Hope you enjoy ! Really easy to do I was bored and mix until I got this is refreshing the kind of drink u will get more then once. Very tasty and low calorie if you use diet ginger ale.